DC Comics might very well have called it "Blackest Night: The Brave and the Bold." Blackest Night, the latest miniseries event from DC Comics, does double-duty both as a line-wide DC crossover, and another chapter in writer Geoff Johns's ongoing Green Lantern series. As such, whereas DC crossovers usually take as their center DC's Big Three characters -- Superman, Batman, and Wonder Woman -- Blackest Night ostensibly stars Green Lantern Hal Jordan, except for the moments when Hal's busy in the Green Lantern title and Johns switches the focus to newly resurrected Flash Barry Allen. Hal and Barry's "brave and bold" friendship, not seen in comics in over twenty years, drives the thematic depth of Blackest Night, and it's engaging even as the bucking of DC's usual stars may feel offputting to modern readers. Indeed, for fans of Brad Meltzer's Identity Crisis or early Justice League work, Blackest Night is very much about the "internal League" that Meltzer suggested. While the Big Three might get the most accolades, the real force of the League when the action ends is Hal and Barry, the Atom Ray Palmer, and then the zombified Black Lanterns who comprise the story's most high-profile villains -- Aquaman, Martian Manhunter, Hawkman, Hawkwoman, and Firestorm. Blackest Night is nearly not at all about the Big Three, but rather spends much of its time excising the final guilt left over from Identity Crisis's murder and mayhem, and returning the League to Silver Age status. To an extent, Blackest Night might also have been called Justice League: Rebirth. As a fan, I rather balk at Superman not saving the day -- he's DC's first superhero, for one, and for two and three he's the leader of both the Justice League and the Super Friends; it's almost blasphemy for Superman not to save the day. But, I'll grant that my affection for Superman stems in part from a general lack of any other DC superhero to latch on to in the same way -- in the mid-1980s Hal Jordan earned his reputation as a "whiner," and much as I like Wally West, he never demonstrated leadership enough to outshine Superman. Blackest Night turns this; Hal and Barry emerge not only as DC stalwarts (at one point, the Atom and Aquaman's wife Mera stand in for Superman and Wonder Woman, but Barry, Atom notes, remains the Flash), but also as interesting characters in their own right, especially together. Again, Blackest Night takes many of its cues from re-establishing Hal and Barry's friendship: Hal died a sinner and Barry a saint, but death, Blackest Night opines, is the great equalizer; Hal is too reckless and Barry too cautious, and their struggles in Blackest Night teach them each a lesson about the others' approach. If their friendship is a little too neat, at least it feels fresher than Superman and Batman's bickering that's become commonplace of late. Yet, more significant than Johns re-centering the DC Universe character-wise is the way he re-centers it cosmologically (and, amidst all the spoilers, this is what I found to be the one great surprise of Blackest Night). Rather than Oa, home of the Green Lanterns' Guardians, being the long-established center of the DC Universe, we learn that all along life began on Earth, and that the Guardians lied in order to protect Earth's life-giving "Entity." This follows a similar sentiment in Johns's Green Lantern: Sinestro Corps War, which established Earth as the center of the DC Universe's multi-dimensional "multiverse." Johns makes a specific choice here that can't be overlooked -- rather than Earth being a backwater planet so uncivilized that the Guardians never deigned to invite a human to the Green Lantern Corps until Hal became one by accident, instead humans are so important that the Guardians kept them -- kept us, Johns implies -- out of the Corps to preserve our safety. To have read DC Comics before Blackest Night was to experience some humility -- whereas humans often exude some "pluck" when placed in sticky situations, most of the universe would sooner have a Coluan or Thanagarian come to their aid than a human (letting alone that our greatest savior is an immigrant Kryptonian). Now, we learn instead that not only are we the linchpin of fifty-two parallel Earths, but also that all life -- everything else in the entire universe -- stemmed from us. The nationalism contained within this is rather staggering. The later years of Star Trek, in comparison, established Earth as a world adopted into the Federation only after many years of eternal strife, and every time Spock raised his eyebrow at Kirk, one gets the sense the Federation still isn't so sure about us. As with much other science-fiction, there's a warning present against cultural relativism, and a sense that our might doesn't always make right; there's always greater forces that know better than we do. Johns's shift may be more uplifting -- you, a human reading this comic book, are special -- but I'm not sure our egos really need that additional stroking. Contained within Blackest Night are sentiments essentially biblical -- that there was darkness in the form of the death-entity Nekron, and there was the white light of the Earth Entity, and that from their ongoing battle came the splintered multi-color Corps, including the Green Lanterns. Even as Hal and Barry fight Nekron, it's well-established in the book that Nekron was there first, and the white Entity is "trespasser" or "invader." I don't believe Johns intends this, but combined with the nationalist sentiment, it's hard not to see Blackest Night as an imperialist text -- we are here, we are the best, and we're staying whether this land is ours or not. Within the Blackest Night hardcover proper, Native American DC hero Apache Chief makes only a brief appearance, but I wonder if he wouldn't have something to say about all this. Johns's Infinite Crisis didn't contain the same amount of subtext, but still I rank it just before the main Blackest Night mini-series itself. Though Blackest Night raises some excellent stakes -- a literal battle between the white hats and the black hats, or life versus death -- it lacks much of Infinite Crisis's moral instability; the Big Three have an actual arc in Infinite Crisis, whereas Hal and Barry's "rightness" here is never in doubt, and a great part of the story is just a sequence of fight scenes. Where Blackest Night works is at its most awkward, or at its most emotional. The resurrected Black Lantern zombies become a tired trick after a while, but when the dead bring up sticky situations, like former Aqualad Tempest stealing Aquaman's girlfriend Dolphin, the reader enjoys the nostalgia of those old stories. By far the most terrifying and moving scene of the story is when current Firestorm Jason Rusch can only watch as the former Firestorm kills Jason's girlfriend; the horror here is not the resurrected dead but the irreversibility of death itself, that Jason is helpless to prevent losing something -- someone -- he can't get back. The idea of death is often lost in all the overwrought superheroic doings of Blackest Night, but in that moment (that some might find gratuitous), Johns gets it right. I also appreciated the throughfare in Blackest Night where Barry mourns the death of Elongated Man Ralph Dibney and his wife Sue, and is disappointed at the end not to find them resurrected. Blackest Night has moments which are too easy (the plot turns twice on Deadman offering a deus ex machina solution out of the ether) but smartly ends on the idea not that miracles are always around the corner, but that life isn't fair -- that good people sometimes die while bad people go on living. Johns expresses the frustration of a person, as he says in the end notes, who's experienced loss himself, and the expression of that frustration is more grown-up than a happy ending would be. Yes, But How Does it Read? Blackest Night isn't a book I'd give to someone unfamiliar with the DC Universe or recent goings-on in Green Lantern; the book makes no attempt to explain, for instance, the identity of the Black Lantern Guardian Scar beyond just showing her on the page. As a volume on its own, I was never lost, though to be sure the Blackest Night hardcover has some large holes in it, the most significant being when Hal disappears and then returns some chapters later in an unexplained partnership with the six members of the other Lantern spectrums (letting alone how his former girlfriend Carol Ferris became a Star Sapphire). The story's conclusion lacks a bit of emotional depth, too, in that the reader is supposed to appreciate the actions of the Guardian Ganthet and former Green Lantern Sinestro, but since they just magically appear mid-story, there's not as much built up behind them as behind the Flash or Firestorm. Still, I would say I was less lost than I thought I would be. It will take a reading of the Green Lantern and Green Lantern Corps volumes to see if those stories suffer from their exclusion from here, but I don't think Blackest Night proper is too derailed by their absence. I am a long-time DC Comics fan. I've seen Hal Jordan replaced with Kyle Rayner, and Green Arrow Oliver Queen replaced with Connor Hawke. I've seen DC's New Earth after Infinite Crisis, where Batman no longer caught his parents' killer and Wonder Woman (re-)helped form the Justice League. I don't want to overstate, but even as Blackest Night wasn't the strongest or most moving DC Comics crossover I've read, I think the general direction it establishes for the DC Universe with Hal and Barry could be the most sweeping change DC has seen in decades. We already know that Superman, Batman, and Wonder Woman can support the DC Universe; I'm cautiously optimistic to see if Geoff Johns can continue to prove that Green Lantern and the Flash can do the same (continuing into Flashpoint, DC's next, Flash-centric crossover); hopefully it'll result in a stronger and more viable DC Universe overall. Coming up on Collected Editions, we'll detail the next six Blackest Night hardcovers, considering how they tie in to these points or raise questions of their own. Hope you'll come along as we look at this significant story in the DC Universe. Thanks! I also found it interesting that the corps seemed like religions (opened to interpretation). Since alot of the entitys that embody the emotions have biblical names and were created through the spirits (both good and bad). I really like this review, very well written. I managed to find almost every BN book at my local used book store. I had a BUNCH of credit, so I basically got them all for free. The only ones missing is the main BN collection reviewed here, and the BN Black Lanterns collection. And I'm sort of enjoying it. Honestly, a lot of it is really disjointed, making me wish they had collected at least the BN, GL and GLC issues together, similar to Sinestro Corps War. Honestly, the multiple colours is just a mess, a lot of which I was laughing at more than anything else. When there's a big splash page in the GL collection, showcasing heroes and villains deputized as various Lanterns, I had to laugh. It wasn't even an awesome kind of silly; it was just silly. I was expecting Captain Planet to show up at any minute. So much of it is just...crowded. You can barely tell what's going on half the time, everything is shown so up close that there's no background to speak of and it's just a mess. The only real enjoyment I've had so far with these collections was the Green Lantern Corps collections...or at least the first half. It all takes place on Oa and doesn't feel quite as crowded. Still, after getting all of these, I've been thinking and thinking and thinking of getting the main BN collection. But to pay full price for it? I really don't know. I'm against the idea not only of how this giant event has been wrongly collected, but that they're all in these unnecessary hardcovers. So, I'm torn. I really enjoyed it. As you noted, it arguably works best as a necessary restructuring of the DC universe. It's a closing chapter and an attempt to turn over a new page. Without preempting your Green Lantern Corps review, there's a perfect moment where a ringslinger decides he needs to return to being "just a space cop". The DC universe has given up on the pompous pretention of being "mature" or "edgy". It's just the DC universe. I also dug the biblical overtones observed above. I love that the opening words invert that famous bit of scripture and Johns evokes a sense of timelessness by associating his fable with perhaps the most enduring fable ever told. It wasn't perfect - Sinestro Corps was a far more "efficient" crossover - but I dug it. If you're reading Green Lantern without the main Blackest Night collection, Nick, indeed I bet you're finding it disjointed; I've found Green Lantern to be the book most dependent on the main miniseries for readability. Green Lantern Corps, as you said, works pretty much on its own until the very end, and then it too gets intermixed with Blackest Night. I mention in my Green Lantern review that I found more effective the two page spreads of a pair of warring, behemoth characters there more striking than the crowd scenes in Blackest Night. Crowd scenes are, of course, a staple of the event crossover, but there's been so many in the Green Lantern books that they're beginning to lose their uniqueness to me. I'm more interested in seeing an artist draw scale and scope than filling a page with characters -- at least today I am. Darren, I agree that tying the Green Lantern Corps -- and Earth -- with the creation story itself is ambitious, to say the least. It is unusual for science-fiction comics -- science-fiction is usually evolutionary (life evolved on Earth, and also on Thanagar and on Okaara), whereas Blackest Night almost posits creationism. Still not sure that's good for DC Comics, frankly, but at least it's unique. I didn't interpret the moment in Green Lantern Corps as a statement of "back to basics" the way you did, but I see your point and how it coincides with Hal and Barry as the new World's Finest. Interesting; thanks. As someone who criticised the way DC collected the Blackest Night books, I have to say I was shocked by how well the main BN book reads on its own. After reading the Green Lantern volume of the saga, I think DC made the right call; none of the action in GL felt strictly necessary, and in fact it'd only hurt the pace of the main title. 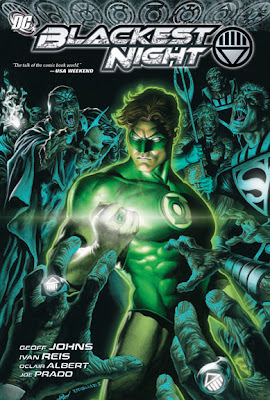 The absence of the Green Lantern book leaves a couple holes in Blackest Night, most notably the out-of-the-blue appearance of the multi-colored Lanterns, but I did appreciate how the one-title-one-book approach gives a consistent artist throughout Blackest Night, Green Lantern, and Green Lantern Corps respectively, and for the most part I agree with you. I wonder if the market would have supported another release of Blackest Night books at the same time, with the stories intertwined? Two different versions of the hardcovers? Great review, really interesting. Thank you for that! I loved reading Blackest Night issue by issue and then in collected form (though the final splash page with the resurrected was split in the hardcover). When I read it month by month, my girlfriend got interested in the series and she read it. And enjoyed it a lot. She hasn't read DC Comics before, but she didn't get lost (except for some who is who) on the main story. I didn't think of this series as something a non expert on DC should read, but she showed me of the contrary. @ collectededitions: I don't know. I'm coming from my own cultural perspective (a lapsed Irish Catholic), but I think that Johns is evoking the timeless nature of the story rather than embracing the theocratic perspective itself. I think he's more evoking the imagery than the dogma. The White Entity is certainly couched in the image of the divine, but it is not God - and certainly not a Judeo-Christian God. What I have loved about DC is the way that the science and theology stand so perfectly together, not necessarily in conflict (I remember James Robinson's great team-up of Etrigan and Ted Knight, for example). Of course, it's a fictional universe, so it has the luxury of reconciling differing philosophical and spiritual positions in a "best of all worlds" sort of way. In the end, I think it's just an effective way of tying the DC universe to a bigger story. Since that story is death and rebirth, I think that spiritual tones are a good fit. Of course, a few years down the line we'll likely get another revisionist history in the mold of whatever that big epic event is. The 17th century Catholic church fully supports the new Johnsian view of the universe. Galileo and Copernicus will go before the inquisition until they renounce their Oacentricism. Again, let me echo, this was a bitchin review! "The imagery [not] the dogma" is a good way to put it, Darren, and that certainly puts the ideas of Blackest Night in a less threatening perspective (when indeed I don't necessarily belive Johns intends imperialism by Blackest Night, my pointing out that thread in the book aside). Yes, that does unite the science of the Green Lantern mythos with the spiritual in an interesting way, and I wonder if this is something Johns means for Hal Jordan to confront -- Hal and others believing they're "just cops," when instead they have ties to the fabric of the universe, Hal especially. I'll keep this in mind on my second read through Blackest Night, someday. Hix, isn't this how the Rann/Thanagar war got started? Your planet's gravitational pull is in my planet's peanut butter? And to think, the early thinkers on Bizarro World were once denounced for thinking the world was square! Glad you enjoyed the review. I've read the three main title and three supporting ones - Tales, GL, Corps - so far, and the only regret I have is not having read Identity Crisis beforehand. That said, I was rather disappointed with the layout of the three hardcovers. During the Sinestro Corps War, every issue was put into chronological order for me, and the reading was seamless. I read Blackest Night throughout teaching summer school, on frield trips and in the cafeteria - I only brought one book per day and read them in the order of BN, Corps, GL, Tales. It felt a bit disjointed reading it this way - it seemed less like the giant crossover I was expecting, and came together in several specific moments which made me happy to read the series. I have heard subsequent complaints that Identity Crisis has essentially been swept under the rug in Jeff Lemire's new Atom stories, but most certainly Identity Crisis is very present here. Given how forgettable crossovers used to be, it's notable how both Identity Crisis, and to a lesser extent Infinite Crisis, remain pertinent to this later series.